The captain needs to carefully read the direction the fish are moving by watching the tuna as they strike and position the boat to intercept them. However, at the same time the boat needs to approach the school so that the wind can aid the cast. A good captain will get the boat in the exact right position about half the time. 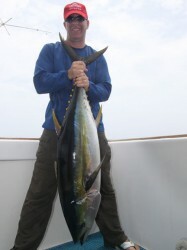 Casting big poppers to yellowfin tuna requires short heavy rods and heavy line. This means that casting distance is already compromised. 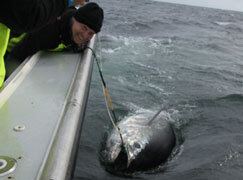 It is critical that the captain positions the boat upwind of the fish so that the anglers are assisted by the wind. When the anglers are casting from the stern, the approach must be perpendicular (across) to the wind. This ensures maximum distance for casts that are thrown abeam. The captain needs to carefully read the direction the fish are moving by watching the tuna as they strike and position the boat to intercept them. 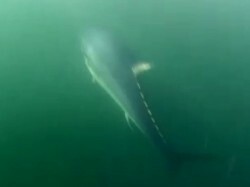 Yellowfin tuna are incredibly fast and can cover hundreds of feet in a few seconds. Driving the boat directly at the spot where the fish are breaking pretty much ensures that by the time you make it to that spot there will be nothing there to cast to. Different boats slide differently when slipped out of gear. It is important to slip the boat out of gear and let it slide into the optimal casting position. Never put the boat in reverse. The cavitation that occurs will almost always spook the fish. It is also important to take into account where the outriggers are and to make sure they are not in the way of the casts. It is usually acceptable to run the boat hard and fast when the fish are a long way away. It is important to make the final approach much more slowly. This ensures a much more controlled slide when the boat is slipped out of gear. 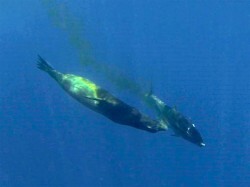 In addition running down hard on the fish will often result in either the fish or the bait being spooked. It is hard for the angler to be patient when the fish are still just out of casting range and the boat is only creeping up on them. Many times the fish disappear before they get in range and the anglers do not get a shot. However, running hard on the fish almost totally ensures that the angler will never get a shot. 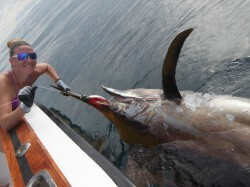 A good captain pays careful attentions to the strengths and weaknesses of his anglers. Not all anglers have the same skills. It is important to establish a casting order, rotation, and routine that ensures everyone gets a shot. The anglers should always cast one at a time. This reduces the chances of crossed lines and allows for the refinement of subsequent casts. When casting from the stern establish a single position where the angler casts from. The first angler steps up into the spot, makes a cast and then slides back along the gunwale to allow the next angler to step up.